Jayme Linton, a good Twitter friend and Assistant Professor for Online Learning & Instructional Design at Lenoir-Rhyne University in Hickory, North Carolina, was chatting last week with Steve Anderson, another North Carolina educator, about a form that been been published by the North Carolina Department of Public Instruction seeking feedback from educators in the state. Not being up on my North Carolina policy and educational initiatives, I took a quick look. It was less than encouraging. Don’t get me wrong, I’m sure there are many good reasons why a state level department of Education would be seeking public comment on an important body of work (in this case crafting digital learning competencies for teachers) using one of the briefest and least rigorous Google Forms I’ve seen published by said agencies in awhile. I hear that North Carolina has been having budget problems, and quite often many bureaucratic types aren’t always well versed in the latest tools being used by practitioners in the field of education. These two reasons alone would have been fine with me, but the documentation that the NCDPI is seeking comments on sounds as though they’re fairly important, and I was taken aback by the brevity of space for responses. I took a screenshot of the form (here’s a direct link if you’d like to view it) and marked it up a bit. Sure, it would have been nice if they had included an image of kids, or a classroom. Yes, it would be been ideal to link to the actual documentation the NCDPI was referring survey takers too (in the interest of ease). But there were a couple of issues I was puzzled about. Like asking some potentially “large” questions seeking considerations, feedback, and reactions while only providing a single text field to submit responses; sure you can type a lot in those boxes, but you can only see the last few words that you’ve typed. Secondly, I’ve grown accustomed to many large state level agencies seeking comments, but also providing a means to submit research, journal articles, and links to publications that help give comments and feedback more depth and support. Ideally, this would ultimately improve a document for thousands of individuals working for a large public institution based on something more than just opinions and feelings. I love opinions and feelings, but when it comes to making large systemic change, you need more than warm fuzzies to help ensure that the opinions you’re listening to have merit. Below is the screenshot that I marked up. After some consideration, and reflection on the thought that the creator of this document was certainly looking for brevity, I decided to improve upon it. So I made my own. On a Friday night. If that doesn’t say something about my lack of a night life, then I hope it at least says something about my dedication to wanting schools, teachers, and educational institutions to be better. I didn’t alter the feedback form too much. I expanded the response fields to paragraph texts, and included a couple of questions that might help give a better cursory glance at the mood of those completing the survey. For example, I tossed in a simple Likert Scale question right off the bat, so that reviewers of the aggregated submissions have a quick visual reference for how educators felt about the digital literacy competencies for teachers (not confident to completely confident). I also included a few places for survey takers to submit important links, resources, and other documentation that might help hone and refine the draft up for review. I tossed in a quick “thanks” and made the “submit optional contact info” field a little more straight forward (name and email, rather than just one box asking for non-specific contact info). Oh, and I managed to snag a nice photo of some students using a few computers at Fort Bragg, so there was at least a human element to the feedback form. Here’s what I came up with. 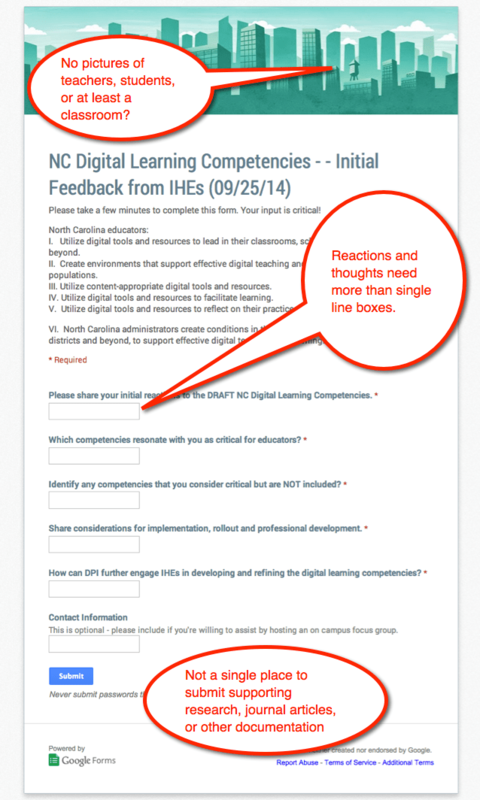 And below is a link to the newly created document, just in case someone wants to send their feedback on North Carolina’s Digital Literacy Competencies for teachers directly to me 🙂 Seriously though, I did this not to be snarky, but to be genuinely helpful. I feel that our leaders, and the refinement or polish they put into their work, serves as a model for the type of work we do as educators. If we don’t see the type of leadership that we feel the larger community needs, then it’s upon us to step up and be the model of what some of the basics of communication and collecting input from stakeholders should look like.